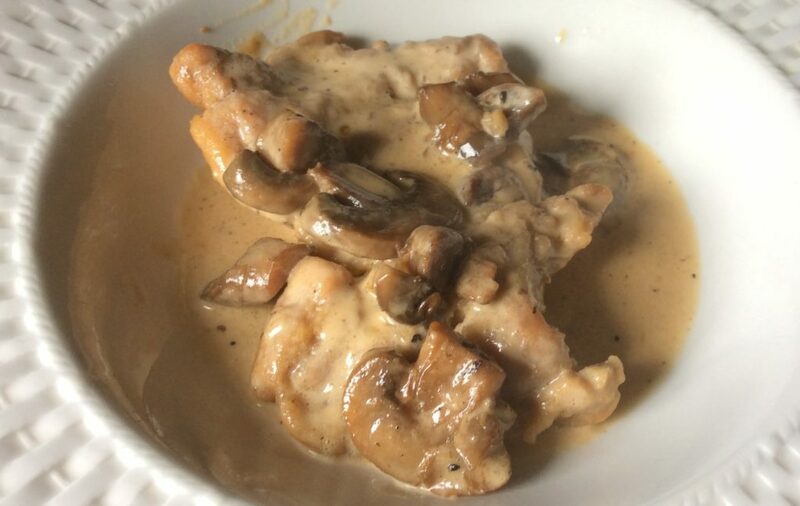 I’ve made this recipe for chicken marsala 3 or 4 times now, and I still can’t believe how incredibly delicious it is. It’s probably the best thing I’ve made. I have the link to the recipe at epicurious in another posting, but I’ve decided to post it here as well and link it from my favorite recipes page. Today I forgot to salt the chicken – but the sauce was so rich in flavor that it didn’t really need it. I also accidentally added a half a cup of white wine, but that only meant I had to boil it a bit longer. I used dried sage, which I hadn’t used before, and I think it probably made it even better. Melt 3 Tbsp. butter in a large skillet and add shallot. Cook over moderate heat until golden, about 1 minute. Add sliced mushrooms, salt and pepper. Cook until mushrooms are golden and the liquid has evaporated, 6-8 minutes. Remove from heat. Put flour in a shallow bowl. Put chicken between 2 sheets of plastic wrap and pound until about 1/4″ thick. Dredge in flour. Set aside. Heat 1 Tbsp. butter and 1 Tbsp. oil in a large heavy skillet over medium-high heat. Sautee first batch of chicken on both sides until golden and cooked through, about 3 minutes per side for chicken thighs. Place the chicken in a shallow pan in the oven. Dry the skillet with paper towels and add another Tbsp. of oil and butter. Melt and sautee the rest of the chicken. Put it in the oven. Deglace the pan with the white wine. Add marsala wine, bring to a boil and cook for 30 seconds. Add water, chicken base, cream and mushrooms – boil, stirring occasionally, until the sauce is slightly thickened, around 10 minutes. Add lemon juice, 2 Tbsp. wine and a sprinkle of dried sage.